Five months ago, Formula One Management (FOM) launched official F1 accounts on both YouTube and Instagram. It was a long time in the making, and both were much needed in order to drive younger fans towards the sport, letting them engage with the content produced. How successful has it been so far? Whilst Formula 1 has a lot of problems on and off the circuit at the moment, social media is one area where the team are starting to get things right. Their Instagram feed launched on March 14th and has since amassed 254,000 followers, which is very impressive in the time period. The majority of Formula 1’s images on Instagram get in the region of 14,000 likes, which helps boost their profile further on the image sharing website. Instagram is owned by Facebook, so some of the traffic could be coming from there. However, Formula 1 does not have an official profile on Facebook, meaning that they are missing out on a whole new audience potentially. For example, MotoGP has 752,000 subscribers on YouTube, but 8.9 million likes on Facebook. When analysing Formula 1 teams and drivers, Facebook has a bigger reach than Twitter and Instagram thanks to Facebook’s significantly bigger user base. The good news for FOM is that their own social media numbers should increase exponentially through the year as more people become aware of the content. The thing that does surprise me is the lack of integration on the official F1 website with Twitter, Facebook and YouTube. A typical article does not have options to share the content on social media websites. Compare that to the Sky Sports or BBC websites where there are various ways to share the content. If anything, FOM should be proactive towards social media services, and treat it as two-way traffic. A user posts a link to Facebook which can then drive other users towards the website, at the moment, FOM are missing out on that aspect. It shouldn’t be a surprise to anyone that the most-watched videos on their YouTube channel contains archive video as the main draw. Sky’s viewing figures may not show that, but casual fans are clearly interested in archive footage of a bite-sized nature. The amount of archive content has increased on their YouTube channel recently, but they are not uploading much content outside of that during race weekends, with other footage instead being kept solely on the official website. On the whole area of video though, Formula One Management need to be keeping an eye on World Wrestling Entertainment’s (WWE) recent figures for their over-the-top Network. After a slow start last year, WWE’s new model is proving more popular, and profitable, than their old pay-per-view model for their monthly extravaganzas. With over 1.2 million subscribers for the WWE Network, other companies need to be looking to see if that model is worth investing in. And that includes FOM, as I’ve spoken about before. Wall Street certainly liked WWE’s news. Unfortunately FOM tend to be behind the bend rather than ahead of the bend. One day I hope it does happen. But their journey is only just beginning, whereas WWE began their Network journey years ago. As mentioned above, FOM (or Formula One Digital Media – whichever you prefer) do not currently have any presence on Facebook. The exact reason for the lack of a Facebook page is unclear, although Marissa Pace did state in interviews late last year that the plan was to launch YouTube first, then Facebook later. Whilst it is great that FOM have a strategy, it could be argued that Facebook can be exploited a lot more than YouTube, so should have been targeted first. On Facebook, Mercedes have a combined audience of 12.26 million accounts, with a reach of around 10 million accounts. Compare that to Twitter. Mercedes there have a combined audience of 4.37 million accounts, reaching around 3 million accounts (the reach is lower than the combined audience as one account can follow many pages). Overall, Facebook from a Formula 1 fan perspective is nearly twice as popular as Twitter. Facebook is worth ten times more than Twitter, which for FOM means that they are losing a huge cut of a potential audience. 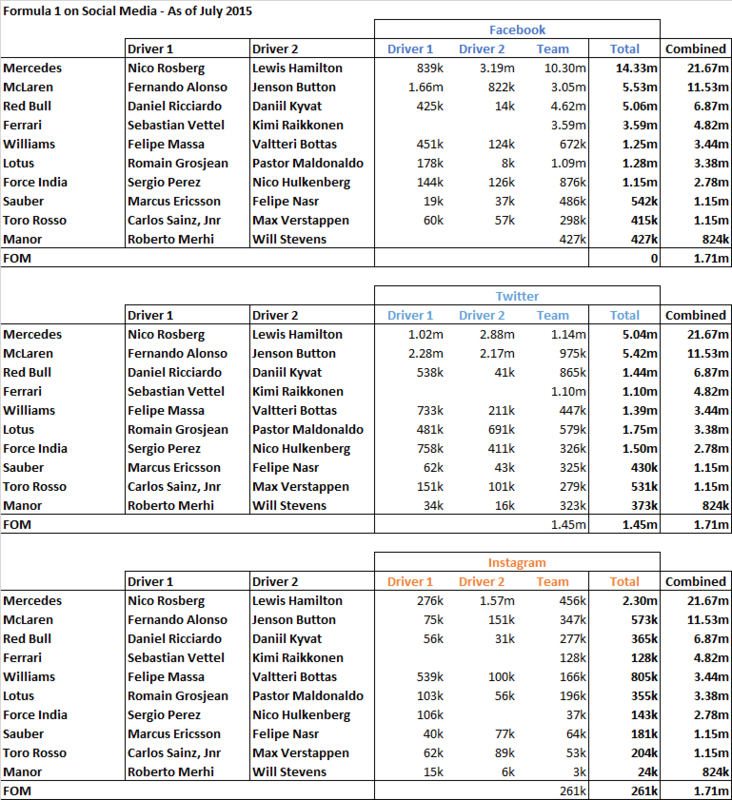 How Formula 1’s and MotoGP’s stars compare on social media, as of July 2015. Trying to analyse social media demographics is incredibly difficult, but the consensus tends to be that Facebook has a broader reach, Instagram a younger reach, with Twitter potentially more dedicated in what accounts may tweet about. Looking at Formula 1 on Facebook, as alluded to above, the official Mercedes AMG Petronas account has a huge 10 million likes. It is not quite the biggest motor sport page on Facebook: Valentino Rossi has 10.77 million likes. Obviously, 10 million is a relatively small number when you compare it to football clubs, for example, Chelsea FC have 44 million likes, but it isn’t a number that should be underestimated. When including Twitter and Instagram, almost two-thirds of Mercedes followers come from Facebook. Lewis Hamilton is twice as popular as Fernando Alonso on Facebook – with 3.2 million likes compared with 1.7 million likes for the Spaniard. Hamilton is by far Formula 1’s most popular driver across Facebook, Twitter and Instagram, which is partly why Mercedes’ combined audience is so much higher across these outlets. As good as Hamilton’s numbers are, it shouldn’t be too surprising that Rossi dwarfs Hamilton’s figures, although Hamilton’s combined audience across the three main social media platforms is higher than Marc Marquez and Jorge Lorenzo. Marquez and Lorenzo though have a bigger reach than the remainder of the Formula 1 field. It doesn’t help that two of Formula 1’s biggest stars have no social media presence. Okay, I can understand why Sebastian Vettel and Kimi Raikkonen stay off social media, but you can also understand why Bernie Ecclestone makes comments like he does surrounding Hamilton and his marketability. The Formula 1 social media statistics, as of July 2015. Ferrari has the highest skew towards Facebook, with 75 percent of their combined followers originating from there. In comparison, only 36 percent of Toro Rosso’s fans come from Facebook, although that number could drastically change if Max Verstappen and Carlos Sainz continue to make an impression in the latter half of 2015. Of course, FOM have zero percent. It’s difficult to say exactly how many likes they would have on Facebook, but you have to be looking at nearly ten million likes, if not higher. The raw numbers in the two figures above really show much much you need a presence on Facebook, as I outlined earlier in this piece. Force India and Lotus have the biggest relative impact on Twitter, the latter shouldn’t be too surprising when you consider the content that they upload to the site in order to be distinctive. Only 23 percent of Mercedes’ following originates from Twitter, but this is down to the huge Facebook number rather than a low Twitter base. Formula 1 teams, drivers and media are only just beginning to exploit Instagram, and that is clear in the figures. Only Mercedes break the one million mark. Hamilton and Felipe Massa are the only two drivers to really grab hold of the image sharing site. Fernando Alonso and Jenson Button, who are big on Facebook and Twitter, currently have a very small presence (follower wise) on Instagram. I think Formula 1 needs to exploit Facebook much more than what it currently is. That will only happen when FOM lead the way by joining the website and share content. I wonder if they are looking to be a part of Facebook’s video monetisation scheme? A lot of work has happened in the past half a year, and it will be interesting to track the numbers further as Formula 1 continues to exploit the various platforms. I firmly believe that Facebook is far more accessible to use as a company (outside of my job I run various community projects) than Twitter or Instagram. FOM would clearly have more clout to find things out about the future of monetising feeds on Facebook and you may be right about that reason for holding back. It just doesn’t make sense to continue to ignore it as a medium. Bernie may be right and it may all collapse in on itself and disappear in ten years time, but right now, it dominates the web of the western world and it’s crazy not to be involved on some level. What surprises me is how few views those top rated videos have. Those numbers are nothing for a fan base of F1’s size. The lack of integration between sites is strange as well, but fairly simple to implement quickly once everything is up and running. Simple sharing is a feature I use all the time. Despite the pushy nature of Google and the driving urge to force everyone onto Google+, not everyone has a YouTube account and therefore subscription to the official F1 channel. Something as simple as Facebook could be the ‘hub’ as it were to accessing links to the YouTube videos. A big yawn to facebook and social media. Twitter is just there for stephen fry, z list celebs, bored housewives and journalists. Blimey, did you really spend time writing all that, you must care. I do not know any of my 50+ friends, family or workmates who all follow F1 that use any social media or would not care. What they would like is the f1 official app payment shared across their devices and web for the timing and videos extras. Shame the new official website is a big step back in terms of design and usability.